One of the most recognized and filmed skiers in the world, Scot Schmidt pioneered a style and remarkable ability that inspired generations of adrenaline-sport athletes. Labeled by Powder Magazine as “the original freeskier,” Schmidt’s impact in the 1980s literally set the stage for dramatic changes in the sport, playing a pivotal role in shaping the ski industry today. Schmidt began ski racing while living in his hometown of Montana City, Montana. He moved to Squaw Valley in 1979 to pursue a dream of making the U.S. Ski Team. Combining his unique racing technique with freeskiing, Schmidt created a reputation for leaving tracks in high places. In 1983 Warren Miller Entertainment invited him to showcase his explosive and suspended style in “Ski Time,” the first of his over 40 films, the latest to be released in 2013. Over the years he was a star of some of the most popular ski films in history from award winning producers including Warren Miller, Greg Stump, Eric Perlman and more. As skiing evolved in the 1980s, Scot Schmidt paved the way with a generation of young skiers inspired by seeing him on film and on VHS tapes. “This is Scot Schmidt,” said Warren Miller in his narration. “His parents raised him wrong.” As if on cue, Schmidt dropped off a jaw dropping 100-foot cliff, leaving kids wanting more. Schmidt was a true pioneer – one of the first big mountain skiers to bring value to the industry as a product tester and building a career around his passion while inspiring others. 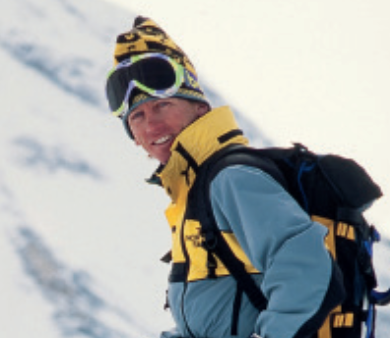 An athlete with The North Face for 30-years, Schmidt has also had a role as a designer and technical consultant with the development of the “Steep Tech” line of skiwear. Since 2003 he has applied his expertise to a series of signature Stockli Stormrider Pro Model skis. In 2009 he returned home to his home state of Montana as an ambassador of skiing for the Yellowstone Club. During winter he can be found in the mountains of Canada and the U.S. promoting the sport and pursuing his passion for skiing. In the summer his focus shifts to surfing and adventure moto, plus enjoying his home in the Santa Cruz Mountains of California. If you notice any errors or inconsistencies in Scot Schmidt's bio, click here to let us know.